The NightWatch Is The Most Advanced Active Bed Bug Monitor On The Market Utilizing a Kairomone Lure, CO2 And Heat To Effectively Monitor And Trap Bed Bugs. Anyone can learn to use NightWatch in 5 minutes! In order to confirm the presence of bed bugs in a room, especially in unoccupied rooms such as family rooms or recently vacated bedrooms, homeowners, property managers, and pest control professionals often employ the use of active bed bug monitors. 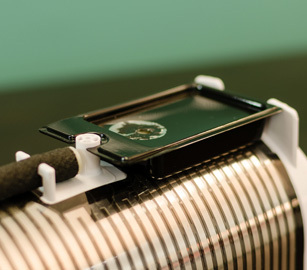 These devices feature a luring system that imitates a sleeping person, drawing bed bugs out of their hiding places and into a trap that the operator can check regularly. The NightWatch has been on the market for years. 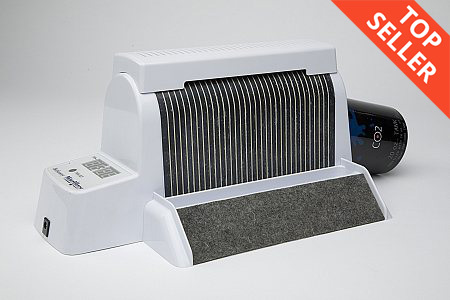 It was developed as the first professional-grade bed bug monitor, and is still the best tool for the job today. The secret to its success is that it uses three different luring methods: carbon dioxide, radiated heat, and a kairomone scented lure. This combination is the best way to mimic a sleeping host, which is the key to drawing bed bugs out of their hiding places throughout a room so that an operator can confirm their presence. The NightWatch comes in a few basic pieces, and setting it up for use is pretty simple. The packaged unit comes with a power cord, two pitfall traps (one for each side of the monitor), a four-pack of kairomone lures, and a top cover that conceals the kairomone lure and part of the radiator. Everything you need is included except for a Co2 bottle, which can be ordered separately on our site and filled for a few bucks at most local paintball supply or sporting goods stores. Any bottle around 18 to 24 ounces in capacity should fit as long as it has a brass fitting. Once set up, the NightWatch will automatically release its lures from 10 PM to 6 AM for 3-4 nights. We recommend running the unit for at least 14 days to ensure not bed bugs are present. As bed bugs come out of hiding to look for the source of the attractants, they'll climb up the grippy ramps on each side of the NightWatch and fall into the pitfall traps at the top. These pitfalls make it easy to confirm bed bug activity in a room, or to monitor changes in the area's bed bug population. 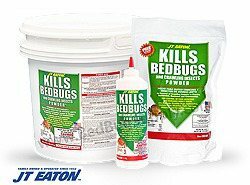 Without an active bed bug monitor, and without a human host to act as the bait, it's difficult to determine if there are bed bugs in a room. A bed bug will only feed once every five to ten days when a host is available. If they can't find one nearby, they may enter a hibernative state and remain dormant for up to a year. The NightWatch active bed bug monitor is the most effective way to solve this problem. It can be used to confirm bed bug activity in unoccupied rooms, such as recently vacated bedrooms, hotel rooms, or apartment units. The NightWatch also essential when treating these unoccupied spaces, since it can draw bed bugs out of hiding to make sure that they come in contact with any chemical sprays or powders that have been applied. Whether you need an active monitor for confirmation, prevention, or treatment, there is no better choice on the market than a NightWatch. NightWatch is an innovative product for pest control operators used to detect bed bug infestations at the earliest stages. BioSensory developed the NightWatch Bedbug Monitor based on knowledge of a bedbug's physiology and an understanding of how the pest seeks a blood meal. Because bed bugs normally bite once every 3 to 4 days, a new infestation of just a few bed bugs often goes unnoticed. It's important to run the machine for at least 14 days to ensure the room has been monitored properly. Bed bugs are often undetectable by the person being bitten and by the most expert professionals in the field. At first, the person thinks the bite is a pimple and then a rash. By the time a skin reaction is recognized as an insect bite, the infestation has grown to hundreds of bedbugs and eggs and is expensive to eliminate. The NightWatch active monitor can detect a bed bug infestation even in its earliest stages, allowing for a faster treatment response. This saves time and money that would otherwise be spent inspecting for bed bugs before starting treatment. Carbon Dioxide: CO2 has been proven again and again, both through lab studies and professional field usage, to be the most effective way to attract bed bugs. We emit this gas while we breathe, and bed bugs are highly sensitive to it. The NightWatch slowly emits carbon dioxide at a similar rate as a sleeping person. Kairomones: In addition to carbon dioxide, an odor attractant is added that mimics the subtle chemical scents of a sleeping person. This host odor attractant works for 7 days, and has been shown to be incredibly effective at luring bed bugs into the NightWatch's pitfall traps. Heat: The missing element in many competing lures is heat. The NightWatch uses a thermal plate that radiates heat to imitate a warm body. When combined with carbon emissions and kairomone odors, bed bugs are easily convinced that there is a sleeping host nearby. Insert the filled Co2 bottle into the opening opposite of the LED display and screw it into the outlet inside. 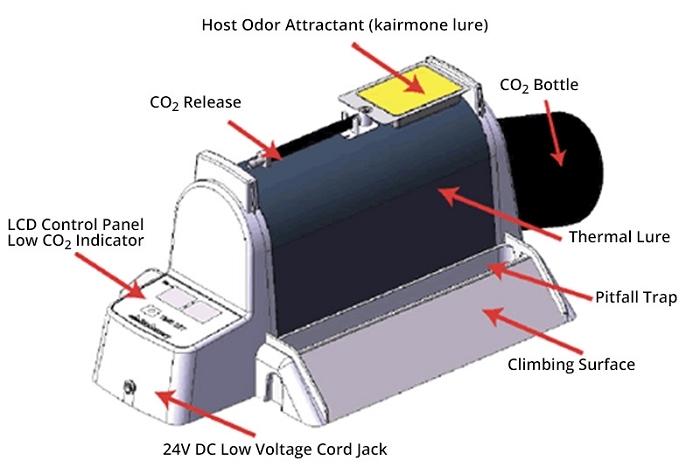 Remove the label covering the opening of the kairomone lure and place the lure on top of the radiator. 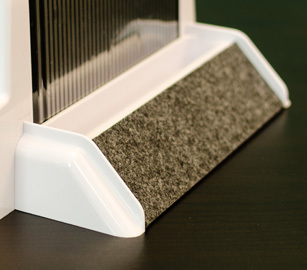 Attach the pitfall traps to each side of the radiator by sliding the back of the traps down onto the vertical ramps. Attach the top cover and plug the power cord into the jack below the LED display. Hold down the "TIME SET" button to set the current hour, then press the "TIME SET" button repeatedly to set the current minute. When the time is set correctly, the NightWatch will only emit CO2 and heat from 10 PM to 6 AM. There are two types of bed bug monitors on the market: passive monitors and active monitors. 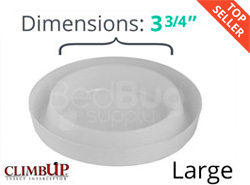 Passive monitors, such as ClimbUp Interceptors, can trap bed bugs that cross them for monitoring or defensive purposes. However, passive monitors do not have their own luring system; they usually rely on a sleeping person to be in the room acting as a bait. Active monitors, such as the NightWatch, use their own lures to draw bed bugs out of hiding and into their traps. 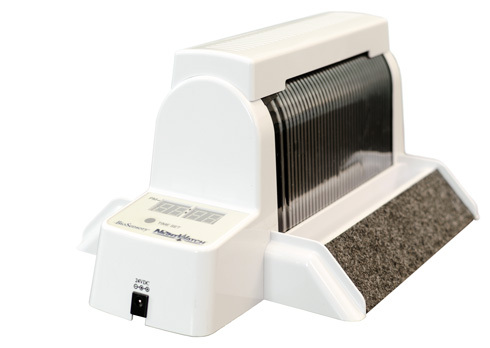 This makes the NightWatch indispensable for confirming bed bug activity unoccupied rooms, such as family rooms or recently vacated bedrooms. The NightWatch is essential when treating these unoccupied spaces as well, since it can draw bed bugs out of hiding to make sure that they come in contact with any chemical sprays or powders that have been applied. 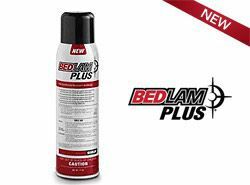 Without using the NightWatch in rooms without a host, bed bugs may just remain dormant without an incentive to become mobile and cross over the applied chemicals. Q: Where can I fill my co2 tank? You can fill the CO2 bottle at most paintball or sporting goods stores. 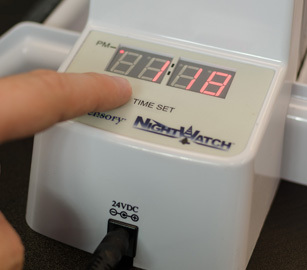 The NightWatch has a 1 year manufacture warranty. Q: Can you use it as you sleep in the same room? While the trap is safe to use in an occupied room, it may not be as effective, since a sleeping person is a much larger and more attractive lure to bed bugs. Active monitors such as the NightWatch are mainly for monitoring bed bug activity in unoccupied rooms. Q: I live in New York City and I'm curious to why the kairomone lure is not available to ship into New York? New York has a strict registration process for residential pesticide use, and the kairomone lure hasn't made it onto the list yet. It may become available for use there in the coming years. All of our active monitors are perfectly safe for use around other people or pets as long as you follow the included instructions. Q: Will this trap/ monitor other pests? Seems like it should work on Fleas as well. This trap was designed specifically to monitor for bed bugs, and has not been tested for other species of pests. Q: can a resident purchase this product: Nightwatch Bed Bug Trap and Monitor. Or do they need a exterminator license? You do not need a license to purchase this product or to use it in your own residence. If you want to use pest control products in other places, you'll need to check your local laws to see if a license is required. Q: Can this be used in a room where a person is indecisive about whether or not they have been bit. If this person was to leave the room for 3-4 days so we can be sure this person does or doesn't have them? 3-4 days isn't long enough to conclude whether or not bed bugs are present. Bed bugs will usually wait around 5-10 days between meals, and the NightWatch won't catch 100% of bed bugs that are seeking a meal in the area. Therefore, there's a chance that bed bugs won't be caught even if they're active in that short time. Q: Does the decvice come with a co2 cartridge already or do I need to buy that in addition to? The NightWatch doesn't come with a Co2 bottle. We have empty bottles available for sale, but you would need to take them to a local shop that offers Co2 refilling. Q: Does this product actually kill the bugs? If it does, is it possible for the consumer to make adjustments so it will NOT kill the bugs, just attract them so we can see if they are still with us after a professional treatment? The NightWatch does not actually kill the bed bugs, only trap them for observation and verification. Needless to say this product really works. I set it up in about 5 minutes and caught 5 bed bugs the first night! We had a pretty bad infestation and caught 30 more within a week. It's now under control and we moved it to different rooms to monitor and trap more. We own several properties and are happy to have this as part of our bed bug arsenal. The price was also the lowest we found, which was a plus! Reviewed by: Marcelo from Cleveland Ohio. Reviewed by: Vernon Coghlan from Goose Creek. I am very pleased with the Nightwatch monitor, it does what it says as advertised. I bought this to use in rental property, and it has caught bedbugs in all stages of life. It is very simple to use and works well. Reviewed by: Roger Uldrick from Lexington,SC. Reviewed by: juan tolosa from galloway nj. Fantastic product! I have been trying to rid my tractor trailer truck of bed bugs for months and after each treatment I was assured they would be gone only to have a poor driver drive the truck and tell me they are still there. One night using this trap and I have immediate evidence they ARE STILL THERE. I can now use this monitor on a random testing basis to ensure they are not in any other trucks. Reviewed by: Scott Law from Nashua, NH. Reviewed by: Randy from Anchorage. Great Item. I was happy but reall depressed after seeing these bugs literally come out of the walls once i turned it on. Caught many bugs after trying everything else. Purchased a second one to hopefully eliminate the problem. Reviewed by: Joey LaSaccha from Cleveland. Reviewed by: ken from nags head , nc. Hi, We have 6 of these and use them nearly everyday for initial and post monitoring for bed bug cases. We have tried ALL the other types of traps and monitors and found this one to be the most effective. Visual inspections are difficult to locate new hatches and areas where you just cannot get to where the bug may harbor. This monitor draws the bug between the CO2 and the heat and finds what we cannot see. The climb up monitors on the beds are also effective for long term monitoring and the tenant can easily check these and report activity. Reviewed by: james joyce from san francisco.